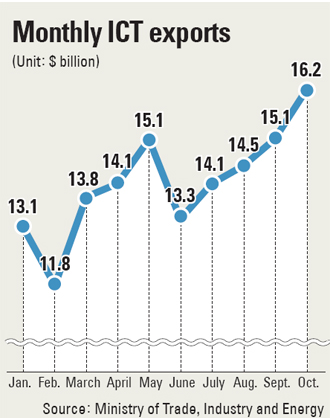 As reported in the Joongang Daily, South Korea's ICT exports in October topped $16 billion for the first time in history. The article noted that "The country sold $2.9 billion worth of mobile phones last month, 30.5 percent more than in September, and $730 million in digital televisions, up 33.3 percent. Exports of semiconductors stood at $5.3 billion and printed circuit boards at $2.7 billion each. Lithium-ion batteries contributed to the growth with $440 million in exports." It also reported that "The global market share of Korean mobile phones was 39.9 percent. 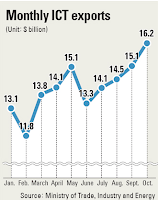 Semiconductor exports increased for the 13th straight month on surging demand for memory chips. As demand for memory chips jumped due to increased use of smartphones, exports of the products soared 43 percent to $2.3 billion last month."